This might be my new favorite breakfast! 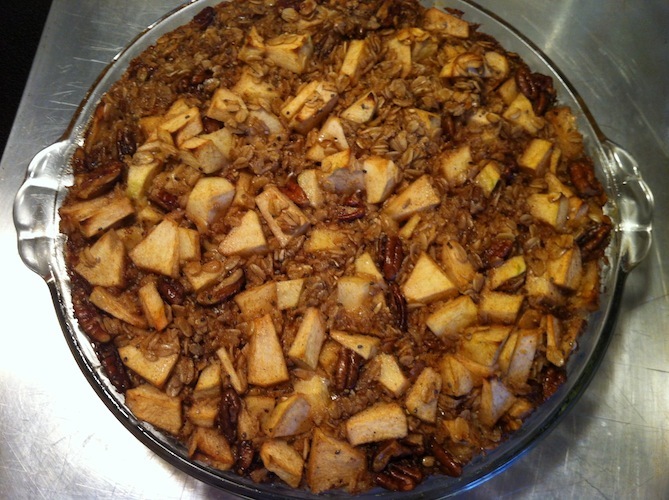 It’s nice and chewy, the toasted nuts are delicious, the apples stay firm, the spices are subtle but warm. This didn’t really hold its shape, but I’m not concerned with looks as long as it tastes good! Next time I’ll probably just make this in a 9×9″ baking dish instead of a pie pan…or maybe double it and make it in a 9×13. Will definitely be making this again! It came together quickly and while it takes a while to cook it just encouraged me to get my workout in early in the day–it’s a win-win! Preheat oven to 375°F. Grease a 9 1/2″ pie dish with cooking spray and set aside. 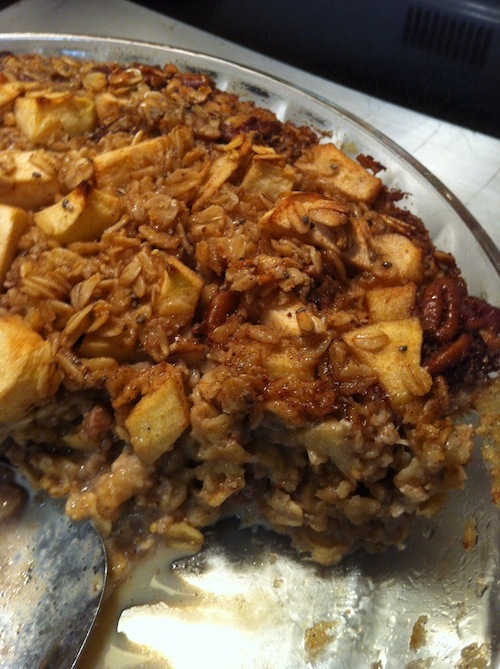 In a large bowl, mix together apples, oats, baking powder, pecans, spices and salt. In a separate bowl, whisk together milk, eggs, oil, maple syrup and vanilla. Stir wet ingredients into the dry until just combined. Carefully pour batter into prepared pan and bake for 45 minutes. Cover with foil during the last 5 minutes if the top gets brown quickly. Let stand for about 10 minutes before serving.